Your order will be shipped within 24 hours with Canada Post! We can not deliver to P.O. boxes. All rural route addresses must include a street address and phone number for delivery. If you have an advanced shipping date order, let us know at the check out. 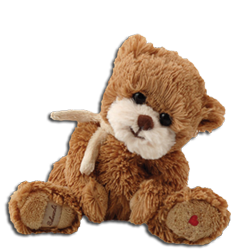 The most expensive Teddy Bear sold at an auction ever was a Louis Vuitton Bear made by the German toy company Steiff. It was sold in the year 2000 at the Monaco action for $2.1 Million. Steiff was also the company that sold the first Teddy Bear in 1903. The teddy bear became a universal sign of warmth, safety and comfort. You can find cheaper and still good quality Teddy Bears here! Teddy Bears for the Baby, chemical free! Our super soft Baby products are free of any toxic chemicals. They are made of non-recycled polyester fibre to avoid any trace of chemicals and flame retardants. • We carry the products, no dropshipping.